Submitted photo Jay Kinsinger and Scott Phillips talk about the E-Bike during the taping of the “The American Woodshop” program from Cedarville University. CEDARVILLE — Jay Kinsinger, associate professor of mechanical and biomedical engineering, will be featured this spring in an episode of the PBS series for do-it-yourselfers, “The American Woodshop.” The episode will cover the design and construction of Kinsinger’s walnut wood e-bicycle. “The American Woodshop,” hosted by Scott and Suzy Phillips, highlights innovative woodshop projects throughout the United States. The episode featuring Kinsinger is set to air Saturday, March 10. Electric bicycles, known as E-bikes, combine pedal power with an electric energy boost. As the rider exerts more force, the motor makes it easier to pedal; the motor multiplies the energy input. The wooden frame makes for a beautiful look and a smooth ride, since the wood absorbs the road vibrations. “It is a piece of artwork you can ride, like the Ferrari of bicycles,” Kinsinger said. Under Kinsinger’s leadership, industrial and innovative design, mechanical engineering and business students produce E-bicycles made of walnut wood. The industrial and innovative design team works closely with the mechanical engineers to develop an attractive yet functional design. The business students handle the marketing, accounting and social media logistics of the project. These students are developing an online business called Sojourn Cyclery and have already sold several e-bikes. From start to finish, it takes approximately 80 hours to create one E-bike. During summer 2017, Mark Weinstein, executive director of public relations, cycled 240 miles from South Bend, Ind., to Dayton on the Cedarville E-bike. The “ride for life” began at the University of Notre Dame and finished at the University of Dayton. Kinsinger has built wooden bicycles for the past seven years. Several of his bicycles were published in the 2017 book “The Wooden Bicycle: Around the World” by Kiriakos Iosifidis. He’s also had multiple bicycles in the Bicycle Museum of America in New Bremen. 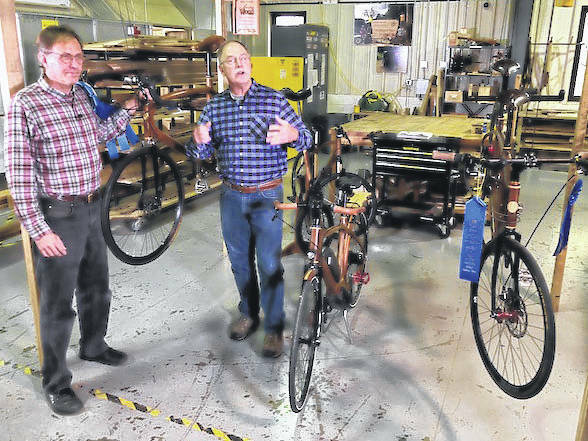 https://www.xeniagazette.com/wp-content/uploads/sites/32/2018/03/web1_kinsinger-pbs.jpgSubmitted photo Jay Kinsinger and Scott Phillips talk about the E-Bike during the taping of the “The American Woodshop” program from Cedarville University.